The Samsung Galaxy Tab works flawlessly with Gmail. In fact, if Gmail is already set up to be your main e-mail address, you’ll enjoy having access to your messages all the time by using your Tab. Non-Gmail e-mail, handled by the Email app, must be set up before it can be used. After completing the quick and occasionally painless setup, you can receive e-mail on your Tab just as you can on a computer. You’re alerted to the arrival of a new e-mail message in your Tab by a notification icon. The icon differs depending on the e-mail’s source. For a new Gmail message, you see the New Gmail notification appear at the top of the touchscreen. For a new e-mail message, you see the New Email notification. Touch the notification icon at the bottom of the screen to see a summary of the most recent message. When multiple messages are waiting, you’ll see a number indicating how many. Touching the notification’s pop-up window takes you to either the Gmail or Email app where you can read the message. To deal with the new-message notification, drag down the notifications and choose the appropriate one. You’re taken directly to your inbox to read the new message. To peruse your Gmail, start the Gmail app. You can find it on the main Home screen or on the Apps Menu. To check your Email inbox, open the Email app. You’re taken to the inbox for your primary e-mail account. When you have multiple e-mail accounts accessed through the Email app, you can view your universal inbox by choosing the Combined View command from the Account menu. 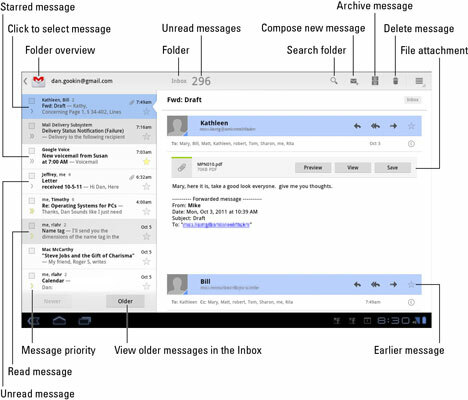 Notice that your Gmail inbox is missing from the Combined View window. Gmail is its own app; your Gmail messages don’t show up in the universal inbox. Search your Gmail messages by pressing the Search button. 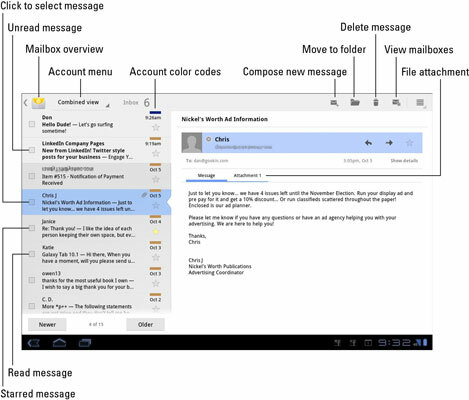 Gmail is organized using labels, not folders. To see your Gmail labels from the inbox, touch the Folder Overview button. It’s found in the upper-left corner of the screen. The Email app is used to access your primary non-Gmail e-mail account. The Messaging app is used to access all non-Gmail accounts. Multiple e-mail accounts gathered in the Email app are color coded. When you view the combined inbox, you see the color codes to the right of each message. Scroll the message list in the Email app to view older messages. The Newer and Older buttons move you through the messages one at a time. As mail comes in, you can read it by choosing a new e-mail notification. Reading and working with the message operate much the same whether you’re using the Gmail or Email app. Choose a message to read by touching the message on the left side of the screen. The message text appears on the right side of the window, which you can scroll up or down by using your finger. Use the Newer and Older buttons to page through your messages one at a time. 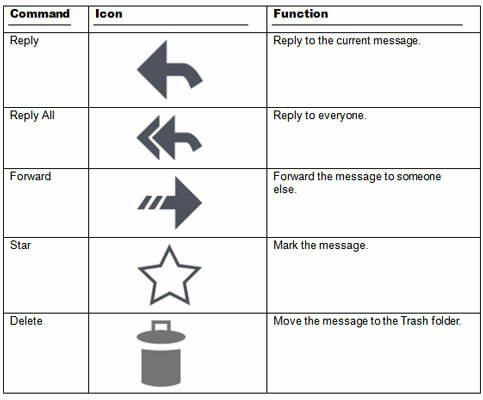 To access additional e-mail commands, touch the Menu icon button. The commands available depend on what you’re doing in the Gmail or Email app at the time you touch the button. Use Reply All only when everyone else must get a copy of your reply. Because most people find endless Reply All e-mail threads annoying, use the Reply All option judiciously. Starred messages can be viewed or searched separately, making them easier to locate later. If you properly configure the Email program, there’s no need to delete messages you read.